This lovely vase is a fine example of one of Kentucky's most unique traditions... horse hair pottery. During the raku firing, actual horse hair is added to the pottery and as it burns away, a graceful ash line is revealed. 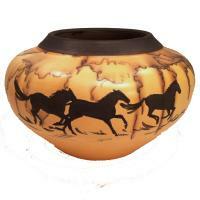 Once the piece cools, the artist hand paints a running horse on the finished vessel. Perfect for the one who loves horses in your life! Size: 8" x 10" x 10"